Conductive keratoplasty (СК) – a new revolutionary technology for vision correction in nearsightedness and presbyopia (aging farsightedness), having FDA certificate and approved for use in year 2002! Conductive keratoplasty (СК) is using the energy of radiowaves, necessary for collagen constriction in cornea in the periphery. Conductive keratoplasty (CK) is developed specially for people in the age about 40 and more, who to not want to be dependant on glasses for reading. By use of the controllable radiowave energy impact on stroma (medium corneal layer), the peripheral corneal layer is pressed. 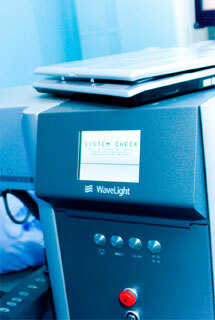 This increases the curvature of the corneal central part and increases focusing. Conductive keratoplasty (CK) is intended for farsightedness treatment (correction) from +0,75 to +3,25 dioptries. Conductive keratoplasty (CK) is also the first and only procedure for vision improvement in a close distance, approved for use in all states of the USA. Conductive keratoplasty (CK) is approved for pilots of aeroplanes! The Federal Aviation Agency (FAA) of the USA approved Conductive keratoplasty (CK) for improvement of vision in close distance for pilots, who used glasses for reading maps and devices before. “The FAA certificate for vision correction of pilots is confirming value and safety of Conductive keratoplasty (CK)”, considers Mitchell Campbell, the president of the company Refractec, manufacturer of devices for Conductive keratoplasty (CK) procedure. Conductive keratoplasty (CK) should not be mixed with laser surgery. The central optical zone is not involved during conductive keratoplasty, eye tissue cutting or burning is not taking place. Energy of radiowaves is microscopically shrinking corneal collagen in a circle, pressing it and changing the form (curvature). 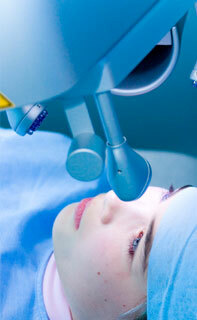 The procedure takes for about three to five minutes for one eye and requires only anaesthesia drops for the eye. Post-operative follow-up results presented by the president of the company Refratec Mitchell Campbell, 87% patients are able to read small size text in the telephone book, 98% - text in newspapers and magazines after the treatment. Your eye will be anesthesied with anesthesying eye drops. A little lid holder will hold the eye from blinking during the procedure. You will be asked to lie on the back and look to the source of light. Light punctual signs will be made on the eye, the emitter will be placed on the signs and will be moved along the external corneal margin. The number of signs is from 8 to 32, depending of the necessary degree of correction. Radiowaves are microscopically pressing the tissue, making the central part of the cornea inside the circle curlier. Some patients prefer to operate only one eye to achieve the effect of “mixed vision”, combination of vision in close and far distance. The physician will examine Your eyes immediately after the surgery, You will be able to go home then and rest for the remaining part of the day. You will have a foreign body sensation, which will decrease within a few hours, especially if you keep the eyes closed without tension. You can use special medicine to decrease the initial discomfort. Active function is restored within one-two days. As during other vision correction procedures, You may have some discomfort and sensitivity (glitter or light nimbus) for several days after Conductive keratoplasty (CK). Vision improves for the most patients immediately after the procedure, however fluctuations of vision both in close and far distance may happen for several days. This is not the reason for worries. 1 to 3 months are necessary for vision complete stabilising. Things may appear a little unfocused in a far distance, but your vision in a close distance can seem too focused, as the cornea is adapting and obtaining the necessary form. The decision to perform Conductive keratoplasty (CK) is done only by yourself. 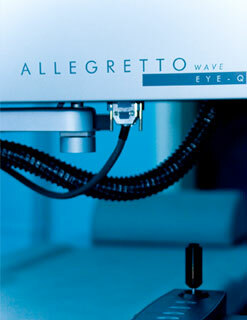 The task of any refractive surgery procedure is to decrease Your dependence from correcting glasses or contact lenses. The aim is to increase Your ability to be able to take part in different daily activities without glasses, e.g., to read newspapers, journals, books, visit cards, price tags in shops, to be able to see the watch details, to take the telephone number, to work with a PC etc. Though Conductive keratoplasty (CK) is a technology ''moving the watch forward" for your farsightedness, the watch does not stop, as we do not become younger after years. It means that the effect of Conductive keratoplasty is not for ever and You will may need a repeated Conductive keratoplasty is Your vision in a near distance continues to decrease with Your age. It is suggested that Conductive keratoplasty (CK) will be used also for astigmatism correction, after-correction of remaining hypermetropy after laser in-situ procedures keratomilesis and FRK, adjustment of repeated myopia correction after LASIK and FRK, post cataract astigmatism, excessive scarring of cuts after radial keratotomy, astigmatism after transplantation of cornea due to keratoconus in addition to treatment of hypermetropy and presbyopia. "There are many fields for application of this method and I consider that it will take a remarkable place in surgery of the anterior part of the eye", - said Dr.Margareth B.McDonald, MD and chief scientict, who is also clinical ophthalmology professor of the Tula university and director of the Southern Vision Institute in New Orleans.